Refuge is an ongoing project of Arts House. It encourages the community to explore some of the difficulties we have experienced in the past and may experience in the future because of our harsh climate. Last year the theme of Refuge was what to do in a flood. This year's theme is heatwave. How do we cope best in the heat? Ideas will be explored by artists in various genres in a free day of events at the North Melbourne Town Hall, which is appropriate given that in a real emergency it is our local community Emergency Relief Centre. Australians are very familiar with hot weather. Sweltering conditions during our summer season are 'par for the course'. We are used to the threat of bushfires. Indeed, many of our readers have probably been touched by bushfire in some way. One hundred degrees in the shade was the heat 'touchstone' of my childhood (37.7 recurring does not roll so easily off the tongue). My father saw 100 degrees in the shade through his long-sighted view of vanishing Riverina horizons. Temperatures on those shadeless plains started at around 100 degrees on a good day; so they did in my childish imagination and so they did when I visited the Riverina, usually during summer. The difference in Melbourne was what my parents called the humidity. A dry heat was their perfect world, with brown grasses and silly sheep running off toward the horizon. Smoke-filled skies over Melbourne, on the other hand, signalled disaster. Swimming was our refuge. When I lived in Windsor we could walk to St Kilda beach. We preferred the small West St Kilda beach, which now is part of the marina. Then it had sand and wavelets. St Kilda beach proper was thought to be more for the sunbathers and perhaps lovers. Fifty years ago we moved to North Melbourne. We thought our house was a bargain, though the agent (Simpsons of course) was surprised we'd pay so much. The place had been empty so long that the Tor Sale' notice had fallen on its face in the front garden. When the heat of summer arrived, though, we discovered that the house was a gem. The ground floor stayed cool through most of a heatwave as the street it faced was lined with plane trees on our side and elms on the other. Shade wherever you walked. One place you could walk to on a hot day were the North Baths. We'd had baths near where we lived beforehand in Richmond, but not too many suburbs in Melbourne were that fortunate. The water was pretty cold back then, but today, according to the Melbourne City Council website, "all pools are heated to a balmy 27.5 degrees Celsius" (81.5 degrees Fahrenheit). North Baths opened in 1910, not long after baths opened at Richmond (1897) and Fitzroy (1908), but several years before those in Brunswick (1914). I am told North Baths were opened by world champion distance swimmer Frank Beaurepaire. He was at the peak of his competitive career and was undefeated in his previous 41 meets. Beaurepaire became a great patron of municipal baths. For him, municipal baths were a focus due to a passion he had developed for teaching young people how to swim. The Herald took this up with its 'Learn to swim' program and the Herald Sun today is campaigning for a return of such programs. The pools belong to the people and have always been important places to cool off for the community. 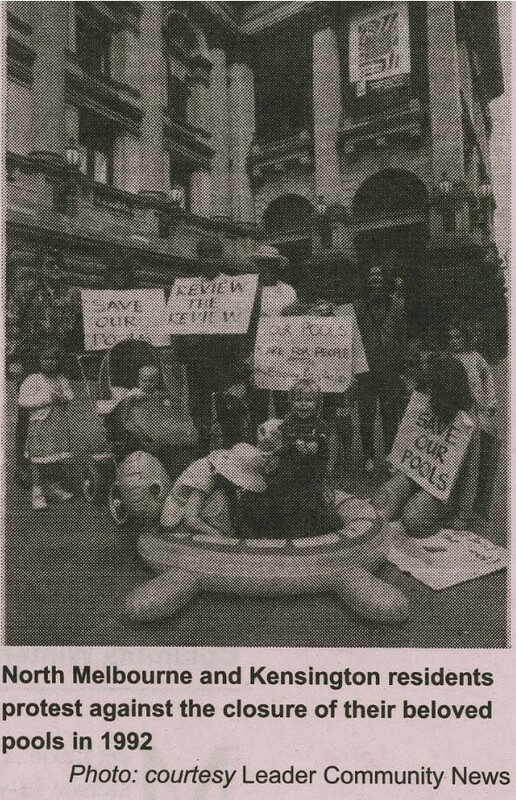 I remember well the many North Melbourne residents joining forces with Kensington people in protest when their pools were threatened in 1992. The hazard in walking the streets of the suburbs on hot days was the asphalt. The black stuff stuck to your shoes and produced bubbles which some said emitted fluid when burst. We longed for concrete but apparently concrete was reserved for the upmarket distant suburbs. We still don't have concrete but asphalt these days seems to be bubble-proof. The pronunciation of asphalt remains unresolved except in dictionaries. My dictionary says: "The terms bitumen and asphalt are mostly interchangeable, except where asphalt is used as a shorthand for asphalt concrete." What on earth does that mean? One of the great joys on hot days long ago was ice blocks. I guess people make them in their own freezers now, or perhaps they've gone the way of many sweets. Back in my day, confectioners made flavoured ice blocks and sold them in ice-block cones, which were actually cubes. Less popular with me was a seeming obsession with cold meat and salad. But even that had an upside: the possibility of eating ham. It was routine for older folk to remark on the inappropriateness of Christmas dinner, but the turkey and pudding easily won the day against cold meats and salads. In spite of the heat, memories of summer are happy because it was also the time of the long holidays, with Christmas and New Year thrown in. Long after schooldays summer kept its holiday feel. It was the time to go to the beach house away from the asphalt pavements and inland fires. Summer combines pleasure with dread in our consciousness. Spring makes us hopeful, autumn wistful and winter inward-looking. Summer excites us.